Two cats can't agree over who eats a mouse caught in the house of the old woman, and after both argue and fight over the mouse, the old woman accidentally tosses them out into the cold wintry night where they realize that neither was right in the fight over the mouse. Yes, this small tale told in poetic verse (and apparently based on a traditional rhyme) is a common-enough plot, but this graphic novel for young readers is a delightful read from start to finish and is sure to get the attention of emerging readers. I loved the pictures in this book. The cats, in particular, are hilarious, with one tall and skinny and other, short and fat. 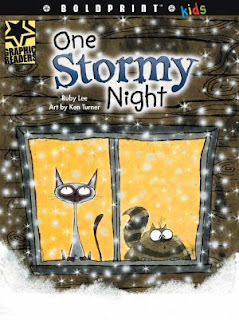 Since the setting of the book takes place at night in winter, illustrator Ken Turner effectively uses the contrasts of white and black to great effect. And the old woman who sweeps the fighting cats right out the door has this sweet, nonchalant look to her that is so very touching. Since this is a graphic novel in poetic form, the use of text boxes, dialogue bubbles and others are part of the story, and they work well, too, in the telling. This small book would be very effective in a younger grade classroom and the publisher, Boldprint Kids, makes sure that the book is designed for learning. The inside page shows us the characters and the last two pages provide helpful notes for additional learning activities for teachers, including vocabulary words and art activities. Plus, any book that also lists literary consultants (David Booth and Larry Swartz) along with the author (Ruby Lee) and illustrator (Ken Turner) is likely created for the classroom. This book is highly recommended for grades kindergarten through second grade.